Ideal for those delivering art and design qualifications, especially GCSE, AS and A Level Art and Design and BTEC. This course will help you to maximise the teaching opportunities afforded by being with art in a gallery setting, with a focus on exam assessment processes and the development of students’ critical research skills. Reflect on your own learning; apply findings in your teaching and measure impact. 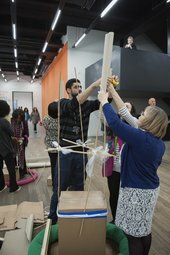 The Schools and Teachers programme at Tate is supported by Tate Patrons, the Lord Leonard and Lady Estelle Wolfson Foundation, Ernest Cook Trust, The Stanley Picker Trust and ArtSocial Foundation. The course surpassed my expectations, I loved researching and analysing through practical methods. The course allowed me to question my practice and think about my pedagogy. It gave me the opportunity to take time out from my world to fully reflect on my teaching/involvement in art.